I AM A® is a multi-award winning modern British stationery, greeting cards and gifts company. We make you smile through playful design. We love cool design. The kind of goofy, quirky, simple design that makes you gasp, giggle and say, “I love that. I want that!". We love to keep desks happy. Founded in 2014, our brand inception was at Liberty London for their “Best of British” Open Design Call where we pitched our first range of stationery products. The buyer provided the opportunity to be stocked in-store, and was our first wholesale client who we continue to work with. We love making things fun. 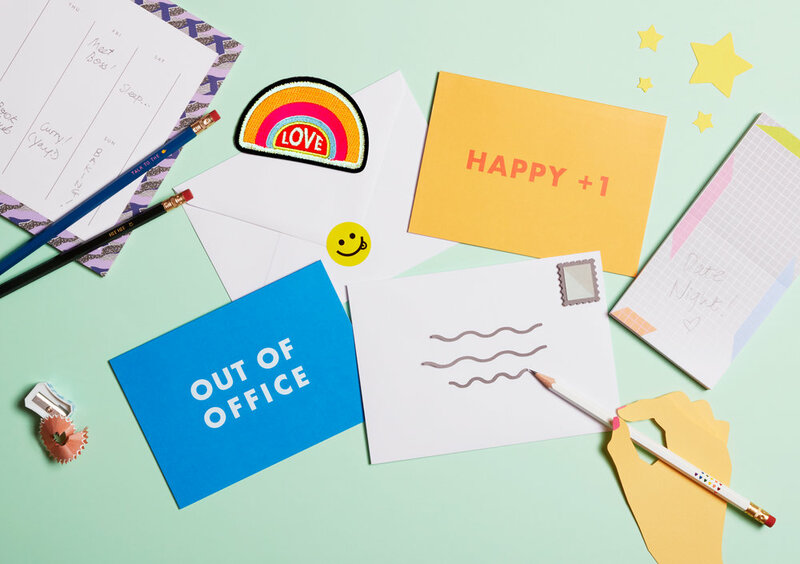 We enjoy old fashioned etiquettes and traditions of thoughtful communication to mark every occasion whilst keeping designs modern and fun with colourful creations bursting with smiles. We relish the joy of connecting with people by sending and receiving lovely hand written greeting cards to mark every occasion; wrapping gifts in lovely smooth wrapping paper. We create super happy products. Our product range includes original illustrated, hand lettered greeting cards, wrapping paper, desk planners, notebooks; well-made stationery including pencil sets, pencil sharpeners and very cute lifestyle products such as embroidered patches. Our products are perfect for gifting, self-use and collecting. Our pencil sets, wrapping paper book both have won design awards from A’ Design Award. Our smiley scratch off scratch cards from our greeting cards range "Don't Be Blue, Scratch and Smile" was a finalist for "GIFT OF THE YEAR 2018" in the "Greetings & Stationery" Category awarded by the Giftware Association. Our products can be found in cool designer, lifestyle and independent shops, galleries and museums in the UK and internationally. This includes Selfridges, Paul Smith, Urban Outfitters, The Conran Shop and many more. Apart from our standard designs, we also offer bespoke merchandise for exhibitions and for retail including Carsten Höller "Decision" at Hayward Gallery, exclusive editions retail products for Selfridges in London, Japanese lifestyle chain store Loft in Tokyo, and seasonal pop up at Le Bon Marché in Paris; and corporate merchandise for companies including Fenwick and Hush Puppies. We care for our planet. It is our commitment to produce premium products in a sustainable way. It is important that a smile and a giggle be part of our end to end processes, from design, production to dispatch – it’s our take on a virtuous smile circle. We want the people who help us make you giggle, to smile, too. This means we make and produce our products with high quality producers in the UK, USA and Japan whilst maintaining environmental consciousness. We bring that smile back to society too. We partner with a social enterprise in the UK, that employs and trains individuals with learning and physical disabilities, who packs and dispatches all our products with love and care to you.